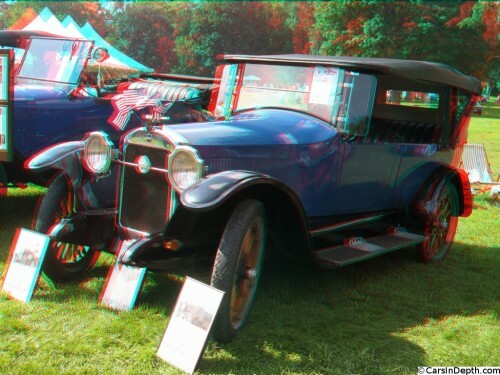 Click on the anaglyph stereo 3D image to launch a Flash player and view the entire gallery of photos in 2D or your choice of S-3D formats. It’s not unusual for automakers to wrap themselves in their national flags. After citing baseball, hot dogs and apple pie, and sponsoring Dinah Shore to tell us in song to see the USA, Chevrolet is the car company that comes to mind pretty quickly when considering automotive nationalism, but they all do it one way or another, in their home markets. Export markets too, in the case of German and Japanese cars. Those cases might be nationalism or they might just be good marketing but there was once a car company whose founder was so patriotic that he built a copy of Philadelphia’s Independence Hall. Actually, there were two car company founders that did that. You may know about one of those buildings and you undoubtedly know about who built it because it’s called the Henry Ford Museum. Percy Owens, however, is less well known, and he built his copy of Independence Hall before Ford did his. By 1916, what had been a curiosity only a decade earlier, the automobile, was now the focus of a booming industry. The DuPont family recognized that and helped Billy Durant reacquire control of General Motors, the company he founded. World War One, the first mechanized war, was raging and GM and other companies would soon find a ready market for their trucks once the US entered the war. In ten years the automobile had become a much more practical machine, with electric starters and enclosed bodies. Ford’s Model T found a huge market among working and middle class Americans (and then around the world). So there was opportunity in the air. Percy Owens had been in the automobile business practically since there were automobiles. He sold Wintons in the 19th century and opened New York City’s first auto showroom. He successfully imported Bianchi automobiles. 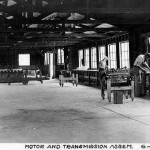 In 1908 he started representing Chalmers, then a major brand and one of the foundational elements of what would become the Chrysler Corp., rising to sales manager for the entire Chalmers company, a position he formerly held at Winton. 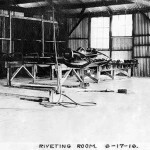 Using his contacts in the industry and with the help of financial backers, Owens took over a factory from the failed R.C.H. car company, an enterprise of Robert Hupp, founder of Huppmobile. 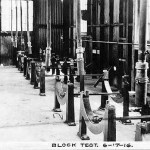 Owens staffed his new company with engineers and managers with solid experience, motor men all of them. He decided to call his company Liberty, in honor of America. To distinguish 3.4 liter Liberty Six from other mid priced automobiles Owens introduced features that are still used by today’s automakers to do likewise. On the outside, unlike most cars of the era which were made to be functional, with little concern for styling, the Liberty Six wasn’t boxy and was made with an attention to style and flowing lines. Inside, the Liberty was designed to be more comfortable than competing makes, with better seats, and easier to operate. Some say that Liberty was the first automaker to consider what we now called ergonomics. Within three years production was up to 6,000 units and exceeded the capacity of the Lycaste Avenue factory. 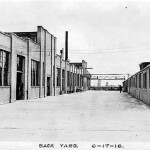 Funds were raised to build a new factory at Connor and Charlevoix in Detroit. The office building in front was a full scale replica of Independence Hall, fitting for a company named Liberty. In 1920 the company changed engines, from an underpowered Continental to a custom designed Wisconsin that produced twice the power and sales climbed to over 9,000. Sales of Liberty cars peaked in 1921, with 11,000 units sold (some sources say 21,000 but 11,000 seems more in line with previous sales levels). Unfortunately for Owens and Liberty, there was a deep recession and sales steeply dropped. In 1922 only 1,624 Liberty Sixes were sold. That wasn’t the only problem the company faced. Liberty was facing the same problems that would plague other independent automakers. 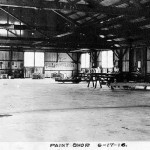 They were essentially assemblers, buying components and bodies from suppliers. The bigger independent companies, like Hudson and Packard, could afford to buy in bulk or simply buy out their vendors to insure supply. 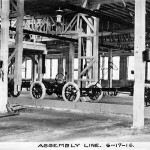 Without sufficient capital to compete, in 1923 Liberty Motors went into receivership. 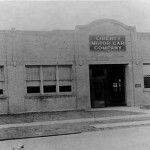 The factory and office building was purchased by Columbia Motor Car, which folded a year later. 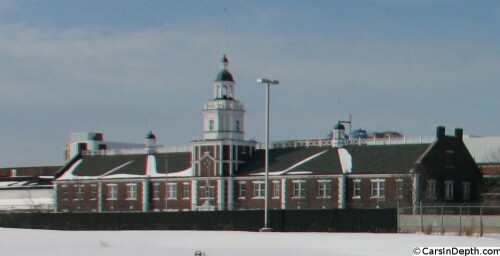 The Budd body company eventually bought the building and it was used into the 21st century, along with “Independence Hall”, by ThyssenKrupp Budd. The facility was closed in 2007, but the building still stands next to the sprawling East Jefferson Ave facility where Chrysler builds Jeep Grand Cherokees. This Liberty Six was at Ypsilanti’s Orphan Car Show. According to one source, it’s one of about a dozen Liberty Motors’ cars that still exist. 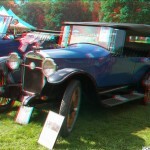 This entry was posted in 3D Imagery, 3D Photos, Automotive History. Bookmark the permalink.